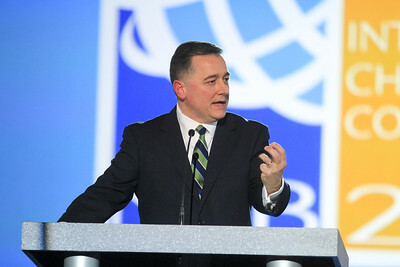 Nashville, TN – Dr. Jerry A. Johnson, the new President & CEO of the National Religious Broadcasters (NRB), was formally installed on the opening night of the NRB 2014 International Christian Media Convention in Nashville, TN. Dr. Johnson was unanimously elected by the NRB Board of Directors on October 1, 2013, after being vetted by the NRB Presidential Search Committee and later selected by the NRB Executive Committee following a five-month search. Prior to his selection as NRB's new President & CEO, Dr. Johnson served as President of Criswell College in Dallas, TX, where he oversaw the operation of one of the nation’s leading major market Christian radio stations, KCBI–FM in Dallas, which was recognized by NRB as Station of the Year in 2011. He has also served in the senior administration and faculty at The Southern Baptist Theological Seminary and Midwestern Baptist Theological Seminary. In his first address to the preeminent association of Christian communicators, Dr. Johnson shared his vision for NRB, including his desire to bring into the fold more Christian bloggers, podcasters, and other new media communicators. He also stressed NRB's three-fold mission - to advance biblical truth, to promote media excellence, and to defend free speech - and how each part is essential today to widely and effectively impact the world for Christ. "This is a new media culture, media country, media generation, and we are positioned like no other association to advance the Gospel of the Lord. There are more media tools now than ever before," Dr. Johnson said, while also recognizing the challenges that exist amidst a changing cultural landscape. He noted how Christian-owned institutions such as Hobby Lobby are being pressured to go against their beliefs in providing insurance coverage for abortion-inducing drugs. Dr. Johnson also urged members of the association and participants of the Convention to speak boldly and stand firmly for the proclamation of the whole counsel of God. "We must speak. We must stand. We must be bold," Dr. Johnson exhorted. He later added how NRB "must become for the First Amendment what the NRA is for the Second Amendment." In addition to Dr. Johnson, Convention participants at Saturday's installation ceremony heard from Dr. R. Albert Mohler, Jr., President of The Southern Baptist Theological Seminary, who has called Dr. Johnson "a leader of rare ability" who "represents a coming generation of leaders among American evangelicals." They also heard from award-winning singer and songwriter Michael W. Smith, who shared one of the songs on his yet-to-be-released album. Other special guests included retired Justice of the Texas Court of Appeals Paul Pressler, who offered the installation prayer. Judge Pressler is a member of the KHCB Radio Network Board of Trustees, a director of Salem Communications Corp., and a member of the NRB Board of Directors. Tony Perkins, President of the Family Research Council, closed the ceremony in prayer. Dr. Johnson officially took office on November 1, 2013.